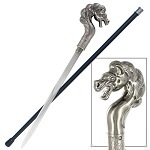 34.5" Roaring Dragon Head Walking Sword Cane. 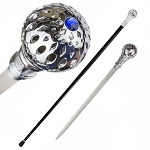 Hidden inside of the black metal shaft is a 12.25” hidden blade made of stainless steel, which can be accessed by unscrewing the handle. 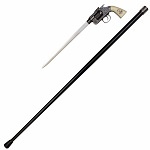 34.5" Bear Head Walking Sword Cane. 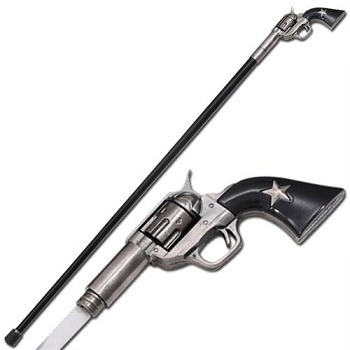 Hidden inside of the black metal shaft is a 12.25” hidden blade made of stainless steel, which can be accessed by unscrewing the handle. 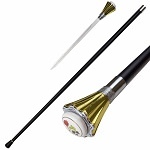 A walking sword cane helps you walk around the town with a cool flair and with safety as well. How? 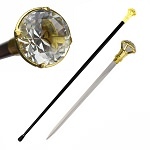 Well, a sword cane actually contains a hidden blade in it. So, it actually serves as a stick and as a self defense weapon as well. 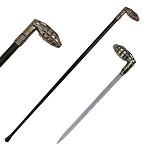 Sword Canes or weapons similar to them have been used throughout the human history, although slight variations were found in each weapon. 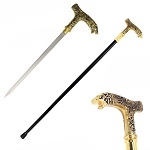 Now you will always have access to a sword without anyone suspecting it. You can protect yourself and your loved ones, anytime and anywhere. 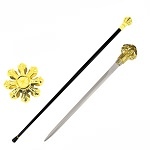 Wherever you are, you can be your own protector and defender. 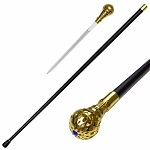 A walking sword cane is a discreet weapon with which you will not have to worry about people screaming and scaring away from you because you are carrying a weapon as it is quite hard to detect that the stick you are carrying, actually has a hidden blade in it. Impressive. Right? 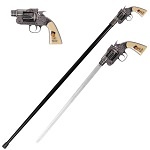 Wholesale Blades stocks one of the most impressive variety of walking cane swords at very low rates. 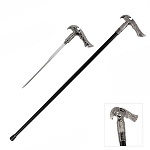 Our sword canes are very unique and feature smart designs. They also have top notch construction. 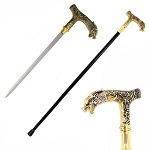 The designs of our sword canes range from the classical ones to the trendy ones as well. 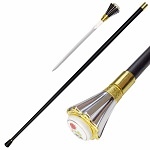 They are quite intricately and finely designed with little details made quite clear. 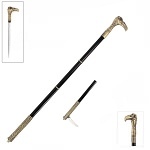 Our sword canes are definitely going to elevate your status and personality as they will provide a graceful aura to you. This was all about the case, but coming to the sword inside it, we must say that it is quite fine and sharp and is capable of performing that kill in a single go. 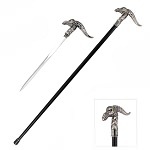 From Dragon head sword cane, Gothic skulls sword cane, Demon Face Web Feet Sword Cane, Thoroughbred horse sword cane to Striking cobra sword cane, we have all of them and so many more as well. 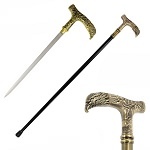 We care about our customers and that is why we offer these amazing sword canes to them at the lowest possible rates. Yes, you heard it right! 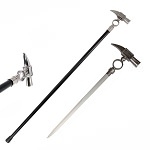 So, browse our collection of the most finely designed walking sword canes and make your purchase now to be your own defender at all times. 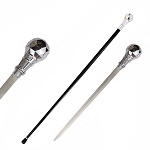 If you are looking for the best dropshipper and wholesaler of sword canes, then you should definitely do business with us as we are the distributor of the best of them. We also have an amazing wholesale offer going on. 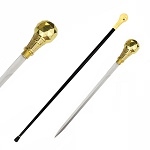 Now, if you buy six or more items of the same sword cane from us, you can avail a FLAT 20% Off that sword cane. 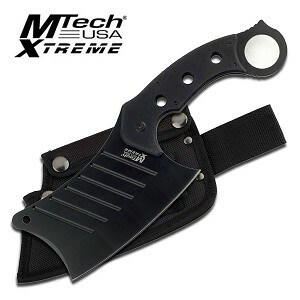 This is the best wholesale offer we provide to our customers as we strive for 100% customer satisfaction. We also offer totally FREE dropshipping and membership services to our customers who are interested in the dropshipping business. 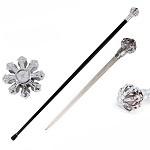 So, browse our collection of the most elegantly designed sword canes and avail these offers as soon as possible by making your purchase now at the most affordable rates.